When multitasking marketers are juggling too many balls at the same time, usually the first thing that falls to the floor is analyzing results. Marketing Automation helps in two ways. First, you gain efficiency thanks to their improved workflow and automatic data handling and all the other things I’ve discussed above. So you are less frantic taking care of the tactics and have more time to focus on the strategy. Second, Marketing Automation does a great job with analytics dashboards. It’s usually the first thing they display when you log in each day, and they email you a daily report of yesterday’s activity and progress against KPIs. Go to the CMS to see how many form submissions were attributed to your landing page. Pull the number of email deliveries, bounces, opens, clicks, and leads from the CRM. Go to the web analytics application to get the pageview statistics for your landing page. Put all the numbers in a spreadsheet and perform calculations for conversion rate, cost per lead, etc. Note that the numbers almost never matched up: Web analytics pageviews would not match the number of clicks, number of form submissions from the CMS would not match the number of leads in the CRM, etc. So what numbers do you trust? What a nightmare! There was a Marketing Operations department that defined dashboards each year to measure marketing performance against goals. It was so difficult to pull together the data that it often took the entire first quarter of the year for them to get dashboards created — one full quarter without marketing reporting! Rolled-up analytics in your Marketing Automation system is a huge advantage! 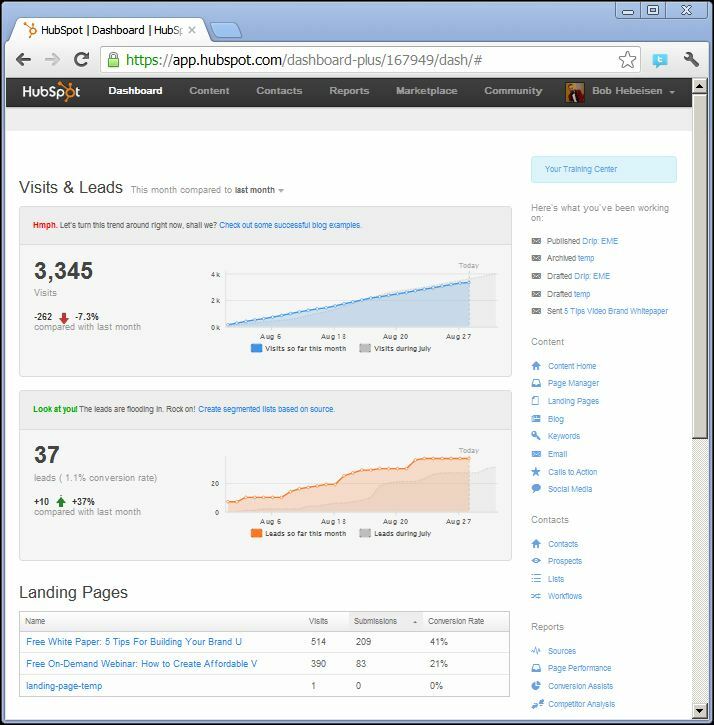 The HubSpot dashboard report gives you a quick look at site traffic, leads, and landing page statistics. The landing page report shows you which landing pages are performing the best, so you can learn from your successful pages and adjust the ones that are under-performing. HubSpot email reporting gives you deliverability/open/click reporting. The HubSpot traffic report tells you what sources are driving the most traffic to your site and which ones are producing the most leads.